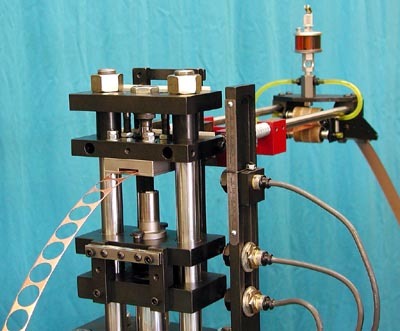 The Corbin JMK-2-H Jacket Making Kit, in conjunction with the Corbin Hydro-Press and Corbin CSU-1 Strip Uncoiler, makes a high precision strip jacket drawing system for a fraction of the usual cost for transfer presses and progressive (sequential) dies. Designed to operate in 40 square feet of floor space, the system is also the most compact, affordable, and precise system of drawing bullet jackets in any caliber, from .123 to 1-inch Gatling, including such favorites as the 50 BMG, 308, 243, and 224 calibers in benchrest quality. 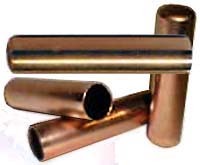 Corbin furnishes 50-pound copper coils, typically 1 inch wide by 0.030-thick strip (other sizes and materials available to order). A coil is placed on the three-foot diameter uncoiler spindle, against a steel backing plate. Another plate is placed on the other side to keep the coil secure. The decoiler unit (CSU-1) automatically feeds just enough strip to keep up with the press, sensing the drag on the coil and silently rolling off just enough material to avoid pulling backward on the feed mechanism. The strip feeds past a sensor standard, with a seven foot spacing between the decoiler unit and the rear of the Hydro-press. The standard press head is removed and the JMK-2 head is installed in its place. The JMK-2 head replaces the entire press head and ram with a sophistocated automatic blanking and cupping mechanism, with a self-contained hitch feed mechanism and lubricator for the strip. Replacement takes about ten minutes. The strip feeds into the lubricator rollers, which are supplied with oil from a reservoir on top of the device. The heavy clear glass tank lets the operator see the lubricant level at a glance. 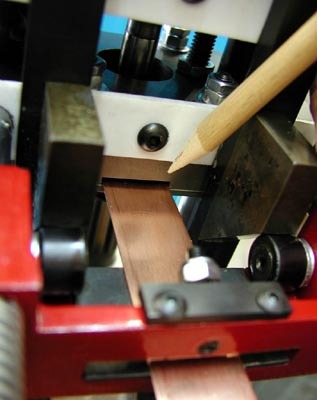 Felt rollers apply lubricant to both sides of the copper strip as it passes the first stage of the feed device. A hitch feed mechanism then move the strip forward in locked timing with the press head movement, feeding the strip when the die opens. The strip passes into a slot on the die, and a duplex coaxial blanking and cupping die punches a disk and turns it into a thick cup in one stroke. The cup drops down a chute in the back of the head assembly, where it can be directed into a barrel or other container. The punched strip continues out the front of the press, where it can be fed into a box. The strip will buckle and fold upon itself after a certain amount has been punched and fed into the container. This punched strip is sold for scrap. A roller cam mechanism on the press head operates the hitch feed. 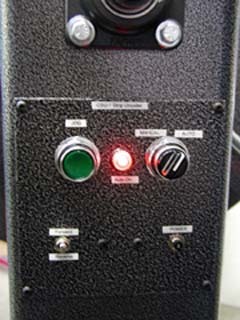 The operator may simply stay in the room with the press and observe the movement of the punched strip to determine whether the process is operating normally. The spacing between punched disks can be adjusted electronically by moving the bottom press head movement sensor up or down. This permits adjustment for the minimum amount of scrap or web between disks for any size of disk. 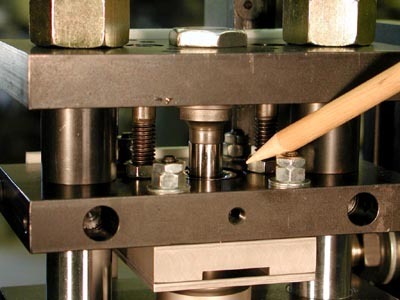 Additional sets of dies may be purchased to use with the same strip, assuming the width and thickness is suitable (a wide range of calibers and thicknesses may be drawm from the same strip, but some may require a different width or thickness). The JMK-2 head and the CSU-1 uncoiler are both rated for a wide range of sizes. The CSU-1 is adjustable for the center ID (or "eye" of the copper coil, and can handle up to 150 pound coils easily. Corbin stocks 50 pound coils because they are easier for a one-man business to handle without additional hoists. The hitch feed mechanism can be adjusted to handle up to 3/4 inch, 1-inch, 1.25-inch, 1.375-inch, 1.50 inch, 1.75 inch, or 2-inch wide strips (or non-standard sizes in between). The heaviest material which feeds well is about 0.075-inches thick, but in most cases all small arms caliber jackets are made from either 1 inch by .030-thick strip, or 1.25 by .050 inch strip. Jackets of nearly any length can be drawn (most jackets are less than 2 inches long, but the press can draw a 3 inch jacket). The cups that are produced automatically by the first operation are re-drawn from one to four times, making them longer, smaller in diameter, and possibly thinner walled. Wall geometry can be built to order, including multiple tapers, single taper, or constant thickness (a small draft angle is highly desirable for easy removal from the punches, but a nearly straight shank joined to a parallel mouth section is common). 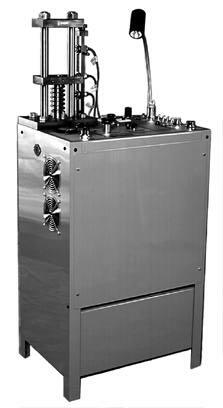 The additional drawing dies are used with the standard press head in the CHP-1 Hydro-Press. A second press is useful for higher production, since it elminiates the need to change the press heads in order to finish the jackets. 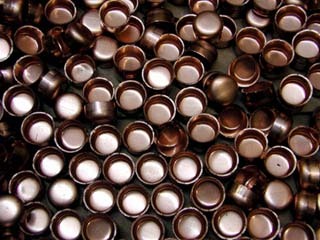 Many calibers may be drawn from one cup, provided that the cup contains sufficient volume of material for the final jacket (obviously a cup optimized for a 3/4-inch long .224 jacket would not have enough metal to form a 1-inch long .458 jacket, but the opposite is possible if somewhat wasteful). A reduction of 25-30% in diameter is usually feasible in one draw without too much friction or stress on the bottom of the jacket. 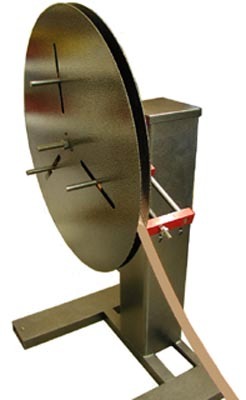 The JMK-2-H Jacket Maker head is normally sold with a CHP-1 Hydro-Press and CSU-1 strip uncoiler, as well as one or more coils of copper strip. The complete system for manufacturing bullet jackets is built to order, for a given jacket. A complete package for making jackets would ideally consist of a Hydro-Press set up with the JMK-2-H auto-feed head, the CSU-1 Strip Uncoiler, and one or more additional Hydro-Presses to handle the redrawing and trim steps which follow the automatic blanking/cupping stage. A CSP-2 Hand Press can normally be used for these steps, unless the jacket is too heavy (thick walled or long) for use in a hand press. A hand operated press develops its power at the ends of the stroke. Drawing long jackets can require full power much lower in the stroke, where the leverage is not yet at its peak. 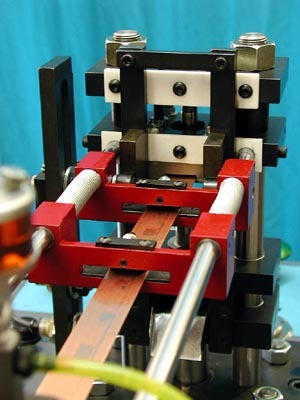 A hydraulic press has the same power anywhere in the stroke. It is this stroke/power curve which limits the hand press, not the maximum leverage or ram thrust. Either a hand press or a power press can develop more than enough power, at the top of the stroke. But a half inch below the top of the stroke, the hand press has greatly reduced leverage whereas the hydraulic press has the same power anywhere in the stroke. Often asked are "How many bullets can I make from a 50 lb. coil of copper?" and "How many bullets can I make in an hour?". The number of jackets which can be made from a coil of copper depend on the size of the jacket, which determines the width of the strip as well as its thickness (volume needed in the jacket). A chart showing copper weight versus number of jackets for different strip dimensions is found on www.Corbins.com/output.htm. Speed of production can be found on www.Corbins.com/speed.htm. Other jackets can be made by adding optional redraw and trim dies to a JMK-1-H designed for a specific caliber and length of jacket. The caliber, length, and wall thickness of a jacket combine to determine the volume of copper required to make it. All of that volume comes from the initial thickness and width of the strip, which is used to punch a disk that uses most of the width. Any jacket that contains the same or less volume of metal can be drawn using that same strip, which means the same disk size, and the same cup size. But you could not make a second jacket using the same JMK-2-H set if that second jacket used MORE volume of metal. Practically speaking, if you have a JMK-2-H set designed primarily for a .458 caliber, 1-inch long, .020-wall thickness jacket, you could not decide later to make .510 caliber, 1.6-inch long, .020-wall jackets with it. But the opposite could be done. Your JMK-2-H jacket maker designed for 1.3 inch long .308 jackets probably will have around .015-.020 jacket wall thickness (typical). If so, you can make the same or longer lengths in .284, .277, and 6.5mm jackets. As the jacket becomes smaller with each draw, the amount of metal squeezed in by diameter reduction is transformed into greater length. At some point, the length can become so great that a trim is required in order to make practical length punches or even to use a reasonable stroke setting for the press. There is a practical limit determined financially to the minimum size of jacket that can be made starting with a strip size designed for a larger, longer, or thicker walled caliber. Obviously, common sense tells you that if you are making a .50 BMG bullet (.510 jacket, perhaps 1.7 inches long and .030-inches thick wall), a vast amount of material would be wasted if you wanted to use the same strip size and redraw the jacket to make a 6mm or a .224 jacket. Most of the material would end as waste or scrap (depending on whether you resell the trimmings, it becomes scrap and gives you a return or waste and gives you nothing back). It is a judgement call just how much of a reduction is practical. Technically, you could reduce a .308 to make a .224 jacket. Financially, it would be a disaster to your bank account because each .224 jacket would cost you the same in material use, plus additional drawing time, as the .308. So you have to balance the cost of another JMK-2-H designed for, say, 3/4-inch wide x .030 thick strip or 5/8-inch wide x .030 thick strip, against the cost of using 1.25 x .030 or 1.25 x .050 strip, depending on your .308 jacket requirement. The costs of copper strip is by the pound. But a pound of 5/8-wide strip is much longer than a pound of the same thickness of 1.25-wide strip. So you get more jackets for the same cost if you match the strip width (and thickness) to the caliber, rather than drawing down a much larger caliber which requires wider or thicker strip. These are not considerations you need to figure out on your own. Corbin will help you decide just how far down it is practical to take a larger jacket before the cost of using a lower volume of copper pays for the cost of the right caliber of equipment. 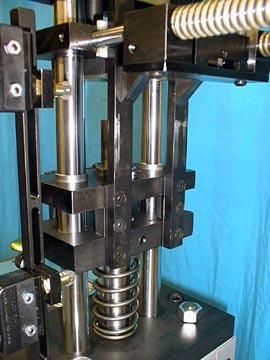 It is generally not practical to get multiple JMK-2-H die sets and change them on the same Hydro Press, because it takes 30-45 minutes to make the change, and if you need the capability of an auto-feed jacket head, you probably also need the complete system running as long and often as possible. Having a second system means a different JMK-2-H mounted on a second CHP-1 Hydro-Press, with its own CSU-1 strip uncoiler. Then you can run both jacket cupping operations any time, at the same time. You can quickly change the re-drawing and trimming dies, however. Therefore, one or two additional standard Hydro-Presses with the normal press head can handle all calibers of jacket finishing, trimming, and bullet swaging. The JMK-2-H is designed with cams and feeder system to advance a strip by the same amount as its width. This is because the purpose is to make a disk, which is the same diameter in all directions, and then draw that disk into a cup. In fact, you can calculate the length and weight of copper strip for any quantity of jackets by knowing the strip width needed for that caliber. The length is the same as the width times the number of jackets. Weight (and cost) of the strip also depends on thickness. 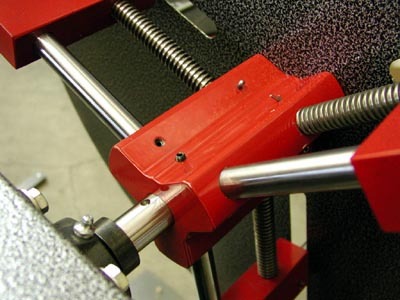 Hand presses are limited to .030-thick strip but the Hydro-Press (and JMK-2-H) can handle .030 or .050 thick material. Delivery typically takes from 90 days, since demand is extremely high. Overtime rush jobs can expedite delivery to less than 30 days, by using overtime (weekends, after-hours work that does not slow down any of the regularly scheduled work) at 2 X normal prices for the JMK-2-H. The press and decoiler are available on short notice without overtime work. Only the dies require overtime for faster delivery.